Viewing topic "Inspiration In A Flash"
The X3A file contents which are shown in the attached image, look like the standard OS Version 1.5 default voices for the XF. The Editor screen you captured is showing the default Voices for User Bank 1. Inspiration in a Flash (IiaF) doesn’t overwrite those Voices, since they are unique (not copies from the Preset Banks). In addition, the Voices you listed are indeed in User Bank 2, not 1. If you want to see what’s in the file, click on File > Import, then select Bank, click on the file folder icon, select Files of type “MOTIF XF All (*.x3a)”, find the IiaF file and select it. It will take a while for data to load to the display, but eventually the Banks will be listed in the left-hand pane. When they are, look at Normal User 2. Damn! 5pinDIN has done it again. I have now successfully updated the XF using Motif XF Editor. Someone once said “it’s better to have smart friends”. Damn! 5pinDIN has done it again. 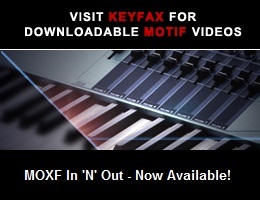 I have now successfully updated the XF using Motif XF Editor. Once you get better acquainted with the XF, it tends to seem a whole lot friendlier. Someone once said “it’s better to have smart friends”. Were those included if your XF shipped with 1.5? Just curious. The additional effects are part of OS 1.50, no matter whether factory installed or updated by the user. The additional Voices and Performances are not installed by the update. They’re found in the linked file - the first 32 Voices, and the first 8 Performances, in the USER 2 Bank of each type.